Shelly Wireman, 25, of Lima, waived her right to a speedy trial Tuesday during an appearance in Allen County Common Pleas Court. Wireman is charged with involuntary manslaughter in connection with the death of her son, 18-month-old Jaxxon Sullivan, who died in a Toledo hospital in April less than two days after being found unresponsive in a Lima home. 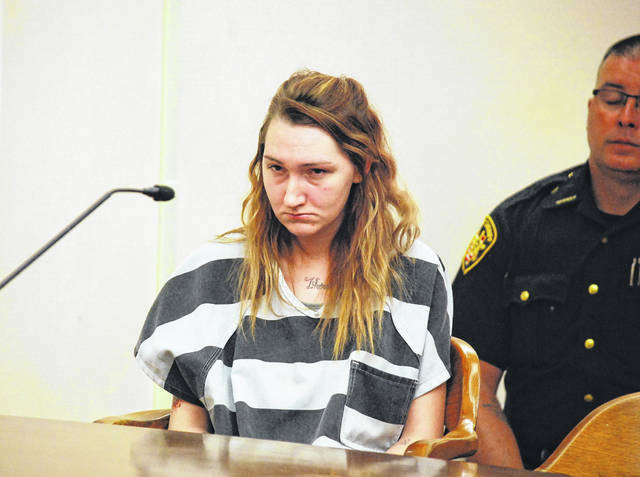 LIMA — A Lima woman charged with involuntary manslaughter in connection with the death of her infant child earlier this year on Tuesday waived her right to a speedy trial. Shelly Wireman, 25, appeared in Allen County Common Pleas Court and agreed to forfeit her constitutional right to a speedy trial. A tentative trial date of Nov. 13 was set for Wireman, who was indicted by a grand jury in May on charges of involuntary manslaughter, a first-degree felony, and endangering children, a felony of the third degree. The charges were returned by an Allen County grand jury in connection with the April 3 death of her son, 18-month-old Jaxxon Sullivan. The infant had been found unresponsive by Lima authorities on April 1 and died two days later in a Toledo hospital. Wireman has pleaded not guilty pleas to charges of involuntary manslaughter, a first-degree felony, and three counts of endangering children, all felonies of the third degree. Her bond was set at $100,000. According to court documents, police responded on April 1 to 826 Oak St., Lima, in response to the report of an unresponsive toddler. The child was transported to Mercy Health-St. Rita’s Medical Center due to several reported injuries and was later transferred to St. Vincent’s Hospital in Toledo in critical condition. He died less than two days later. The subsequent investigation led detectives to arrest Gabriel Salyers — described by police as Wireman’s live-in boyfriend — and charge him with murder. Salyers, 31, of Lima, has entered pleas of not guilty to charges of aggravated murder and murder, both unclassified felonies; three counts of endangering children, felonies of the second degree; and single counts of domestic violence with a prior domestic violence conviction, a fourth-degree felony, and possession of drugs, a first-degree misdemeanor. He is being held under $1 million bond.